Drupal vs Magento. Which one to choose? Earning money in the internet is a real thing. You may be either a content provider who sells some products or a real e-merchant dealing with a great retail sales. Sometimes you may position yourself halfway in between, and it’s quite normal. If you want to have a profitable e-commerce business, you should certainly build a handy and easy to use web platform for your activity. For instance, you may create an online store or a website for e-commerce tasks. Nowadays, there is a great number of tools which are able to assist you in creating and developing your online venture, and it’s obvious that you may have certain difficulties in choosing the most appropriate one. Today we are going to speak about two most popular CMS that are often used for creating e-commerce web resources. So which one would you like to choose: Drupal or Magento? Magento is an online store engine which was developed for carrying out e-commerce tasks in 2008. It was written in PHP language, includes pieces of the Zend GFramework and uses the MySQL relation database system. You don’t need to pay money for using Magento, that’s why nearly 250.000 online stores use it at present. Overall, Magento is rather handy in use because it comes with a shopping cart ready to take orders, a great number of languages, currencies and local tax rates. It’s an open source that has a support of an active community of developers, so you may either shop standard Magento modules in the Marketplace or ask a specialist to develop something unique just for your site. Drupal was thought to be a content Management System (CMS). However, at present it positions itself like a framework which is able to support various types of websites. Like Magento, Drupal is open source, and it was also written in PHP language. It has a standard release known as the Core. Overall, you may find nearly a million of websites that use Drupal. Especially, it’s popular among e-commerce websites. For instance, the Drupal Core is able to display products, accept orders, monitor payments and track invoices. You can also find loads of additional free modules available for linking to shopping carts, shipping services and payment gateways. There is also an opportunity to use Drupal Commerce. It’s a separate installation and configuration. Why Are Drupal and Magento Different? 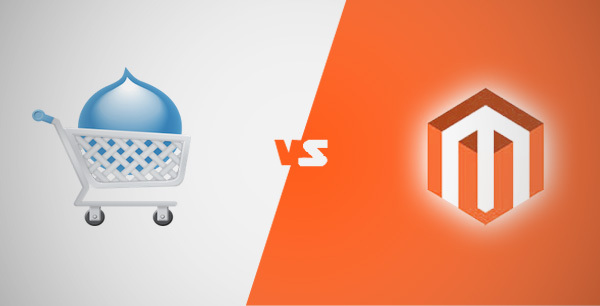 Now, we are going to compare the capabilities of Drupal Commerce and the capacities of Magento CE to show some distinct features between these two e-commerce systems. Installing Magento has always been a real pleasure. It will take only ten minutes of your free time, the creation of an online store here is almost effortless. If you decide to use Drupal, you may run into problems at the very beginning. For instance, you may need to install a separate Commerce Kickstart application. It’s offered on the official website and is needed to skip a few weeks’ configuration when creating the e-commerce site in the Drupal Commerce framework system. It takes not much time to install Kickstart and, as a result, you get a nice demo store with theme, search features, catalogue and a back office interface. The Magento interface is a mature, well-tried platform that is extremely easy to study. Nevertheless, it’s really rich in various tools, and it may cause you a certain headache at the beginning, because you will need to investigate a great number of menus, options and possible variants while creating your online store. That’s why it’s often highly recommended to view several training videos or surf some information in the internet before you start doing anything. Drupal also requires a certain amount of time for studying. However, its newest version is much easier than the previous one and features a special administrative module that can be displayed on the website and makes the modification process quicker. If you are going to trade thousands of goods via your online store, you certainly need to install the narrow-down search option into it. This is the main thing that makes Magento really distinct, compared to other e-commerce platforms. Once you’ve supplied your online store with the narrow-down search option, you give your potential clients a nice opportunity to start a search based on price range, brand, color, categories and etc. While using Magento, you may also customize any product attribute in the database and give your potential clients an excellent opportunity to search on everything. Drupal is rich in customizing possibilities concerning appearance. While using this e-commerce system, you are able to create a really unique design for your site. For instance, you may use free designs or purchase them. If your budget is really big then you get an opportunity to hire a person, who will create a unique appearance exactly for your web resource. Choosing between Drupal and Magento depends greatly on your business goals. If you are going to create a web resource to promote a small number of products with content marketing tools, Drupal may become an ideal variant for you because it’s operating as a content management system. However, creating a big online store with various products requires more complex e-commerce system, and Magento is the more optional choice in this case. While creating your online store or e-commerce site, don’t forget about the things that will make your web resource a quick one. Visit the official CDNsun’s website and get a detailed information how to speed up your web resource.